July 21st.-Got into billets at about 12.30 a.m. Regiment resting all day. Very hot. C.O. and Adjutant reconnoitred country north-west of Bray-sur-Somme. The traffic through Corbie at present is just like that in Piccadilly—hundreds of lorries, etc., passing through all day and most of the night; most difficult to sleep. July 22nd.-More or less standing by all day, expecting orders to move. Bathing parade before breakfast. The 5th Brigade relieved a brigade of the 3rd Division. July 27th.- The Germans had been firing heavy shells all night, and the companies had had a bad time. Fairly quiet day, ex­cept for some shelling of the vicinity of Regimental H.Q. Ordered to re­lieve 2nd H.L.I. tomorrow in frontline trenches about Waterlot Farm. July 28th.-In the early morning the C.O., Adjutant, Bobby (Grenade Officer), and Horley (Lewis-gun Officer) went round the trenches at Waterlot Farm. At about 7 p.m. we moved up to the front line, to relieve the H.L.I., going via Bernafay Wood, Trones Wood, up Longueval Alley, to the edge of Delville Wood, and then past Waterlot Farm. It was a horrible walk, the ground being strewn with dead, in all positions and much decomposed. As soon as we arrived there was a scare, and our companies were blocked coming in. The H.L.I, did not get away until long after midnight. July 29th.-A quiet day and very hot. Very busy all day making preparations and getting out orders for our attack tomorrow morning, orders for which were given verbally to C.O. 's yesterday. We moved our H.Q. in the evening to Divisional H.Q. July 30th.-Zero was at 4.45 a.m., i.e., daylight, and much too late. The attack by B and C Companies on Guillemont Station failed after repeated attempts, and so the other attack (by A and D, towards Ginchy) failed also. We have 12 officer casualties, and more than 200 men. We naturally had no rest for the remainder of the day, and a disturbed night. July 3lst.-Got orders about 2 a.m. that the H.L.I, were relieving us, with the exception of D Company, who had to be left behind. We were back in our old position, near Brigade H.Q., about 7 a.m. There was considerable shelling during the night, so we did not have a very good night's sleep, as we had hoped. Para 1. 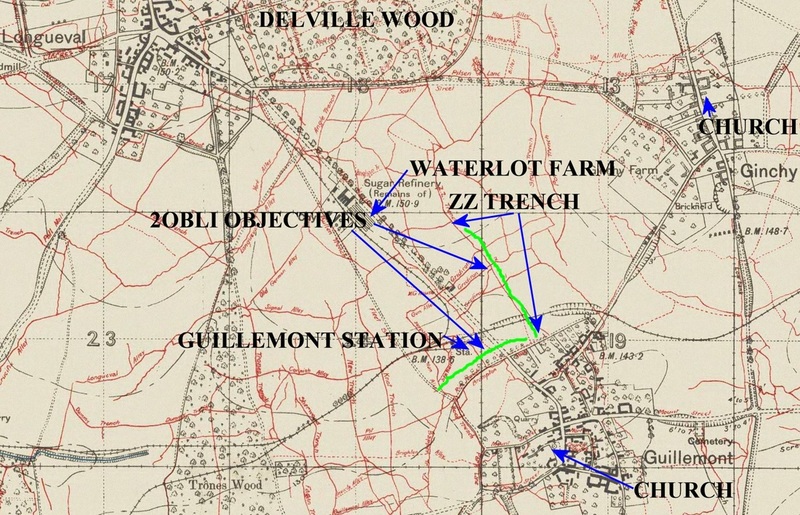 The 5th Infantry Brigade, in conjunction with troops of the 30th Division, will attack and capture the village of Guillemont, Guillemont Station, and the German trenches east of Waterlot Farm on the morning of the 30th July. The hour of zero will be communicated later. 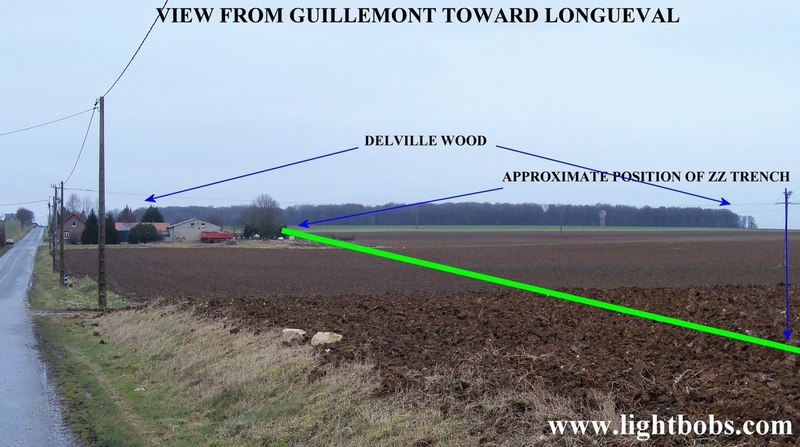 (a) The enemy's defences between Waterlot Farm and Guillemont (exclusive), including the trench which runs parallel to the Longueval-Guillemont Road through T.19.a. S.24.b, and S.l8.d. (b) The German trenches running from S.l8.d.5.5, T.19.a.7 1/2, T.19.c.4.9 ½. When captured, the northern extremity of these trenches will be joined up with our present line in the south-east corner of Delville Wood. (c) To gain touch with the 30th Division. After reaching the objectives the railway will be the southern boundary of the Brigade. Para 4. 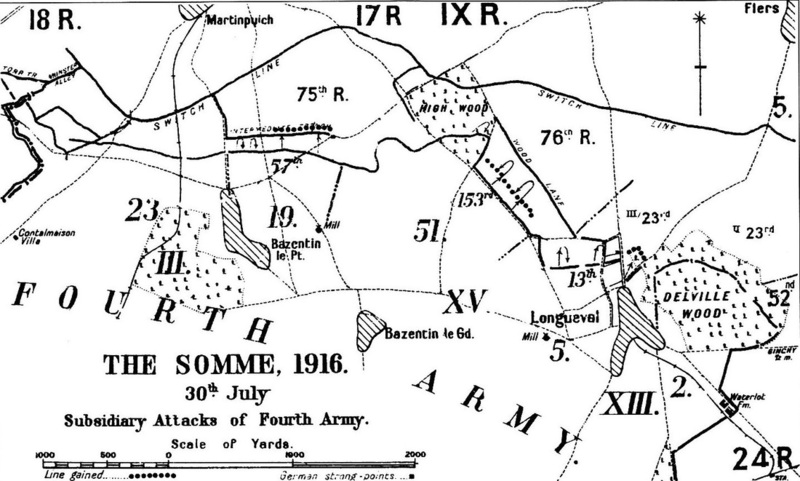 The Infantry of the 30th Division will assault their first objective, so as to reach it just after 0.8, at which hour the barrage will lift to the second line. (b) The portion of German trench situated in S.l8.d at the same time as the Infantry of the 30th Division reach their first objective. Paragraphs 5, 6, and 7 mentioned the work that would be carried out by the artillery and machine-guns, the latter from the S.E. 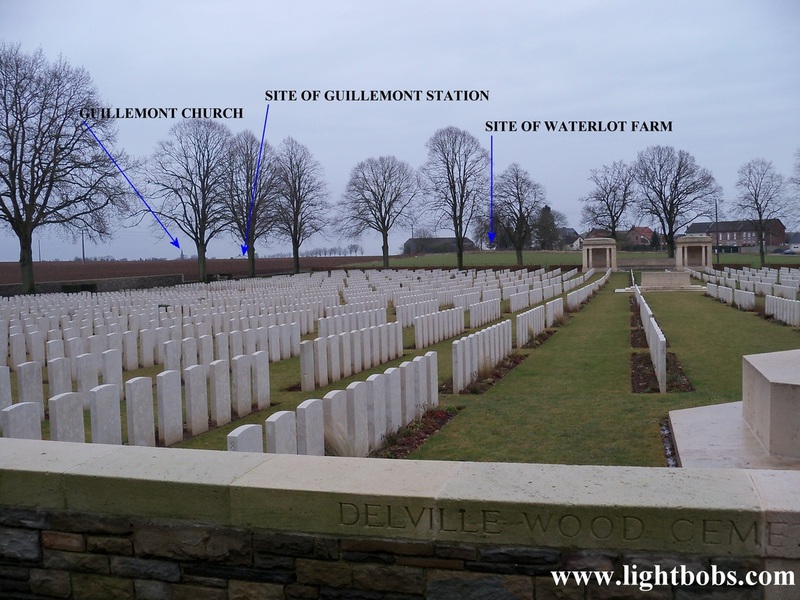 corner of Delville Wood sweeping the ground between Ginchy Village and the German trenches, and the former cutting the wire in front of the German trenches, and then barraging by lifts in accordance with times marked on an attached map. "The right Battalion will be responsible for Guillemont Station and trench immediately south of it, and, in the final objective, for hostile trench from T.l9.c.9 ½ (exclusive) to S.24.b.8.8. 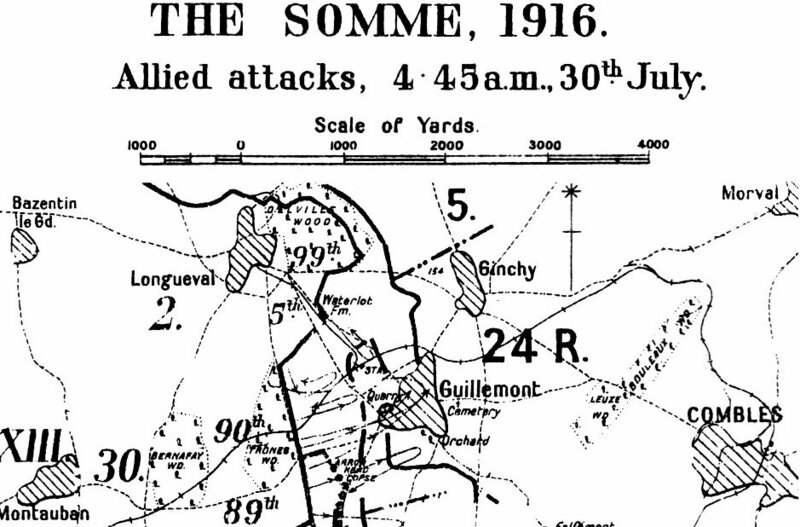 "The attack on Guillemont Station will be timed to commence at 0.8 (i.e., zero + 8 minutes). "Prior to this time the attacking troops will crawl up as close to our barrage as possible. "At 0.25 the attack on enemy's trench T.19.c.4.9 ½ to S.24.b.8.8 will be carried out; in this case also the one and a half companies detailed for this objective will approach as close as possible to our barrage. "At 0.8 the left Battalion will attack and consolidate enemy's line from S.24.b.8.8 to S.18.d.5.5. They will also furnish a com­pany for the purpose of joining up the captured line to the south­east corner of Delville Wood. The order for this latter work to commence will emanate from O.C. 24th Royal Fusiliers, who will decide when the situation admits of the digging being carried on. It is not intended that this trench should be dug continuously, but work will be concentrated on a chain of small posts which can be joined up later." "One and a half companies for attack of station will be formed up as directed by O.C. Battalion. The attack on the station will be made from the N.W. "One and a half companies for attacking enemy's line will be formed up as detailed by O.C. Battalion. "One company, as already detailed, holding our line. "Battalion H.Q. in present front line." about 30 to 45 minutes to Brigade H.Q. Para. 13 a section of the Brigade Machine-gun Company was detailed for garrisoning the station when captured. The remaining paragraphs of the Orders gave short but detailed instructions for the employment of the R.E., the evacuation of the wounded, the disposal of prisoners, etc. companies going over the top" were to have waterbottles filled and one day's ration per man, in addition to iron ration. "The Divisional Commander desired me to impress on you the importance of your right flank. It is possible that the 30th Divi­sion may meet with very stubborn resistance, and, naturally, your advance to the second objective cannot proceed with the right flank in the air. "By holding the station you can very materially assist the main operation. "In case I am not able to come and see you, I wish you and your fine battalion the best of luck." "Attack on station at first held up by line of bombing posts is now getting forward, but I cannot yet tell whether it has reached objective. Heavy casualties." 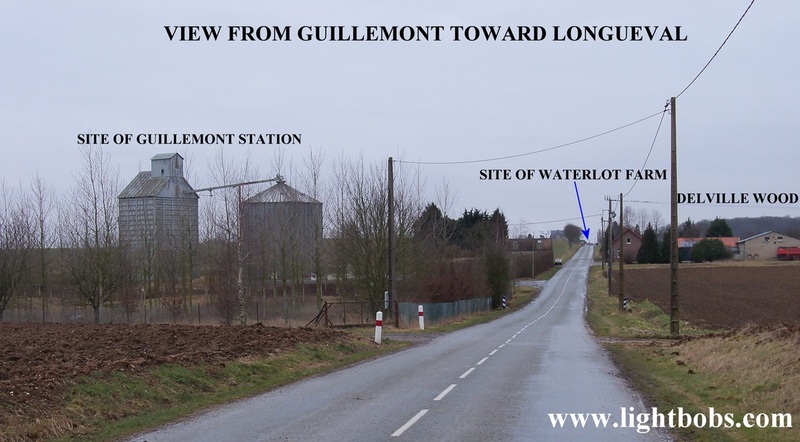 The 30th Division on the right carried the village of Guillemont, but the 5th Brigade was checked at the outset, the Regiment meeting with strong resistance from the enemy's bombing-posts, which the Stokes mortars failed to silence as intended. Instead, therefore, of the attack sweeping over the bombing-posts, it became disorganized for a time, but then pushed through in two columns. Heavy machine-gun fire broke on the rear waves, and the Brigade was unable to carry its objectives, which necessitated the with­drawal also of the 30th Division from the village of Guillemont. The farthest point reached by the 5th Brigade was Guillemont Station, which officers and men of B and C Companies of the Regi­ment are known to have entered, although none returned.